The ever-reliable late-night team on BBC News strikes again. Thanks to Dennis A, Jon C, Greg L and everyone else who brought this soon-to-be classic to my attention. Blimey. 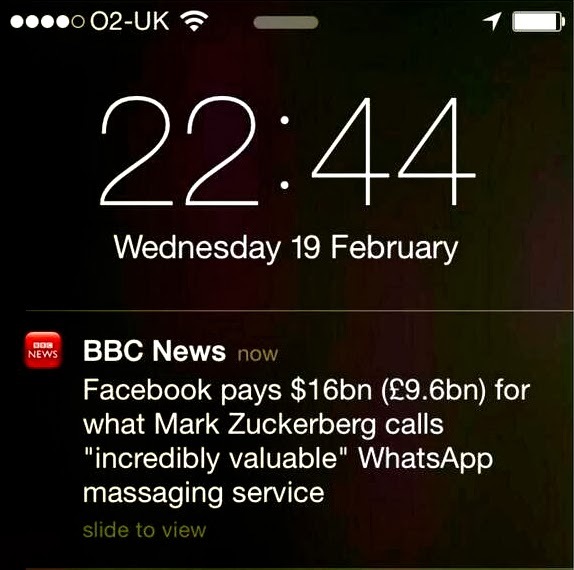 If that's incredible value, I'd like to see - or preferably sample - a massaging service that's expensive. Incidentally, I've just found a link to what's reported to be the world's most expensive massage service. For the sake of those who are perhaps a little sensitive about such things, it's not a direct link. But you'll find it soon enough if you go looking. It's a place where the line between massage and other, er, more specialised services grows decidedly thin. Anyway, getting back to Mark Zuckerberg, WhatsApp must have seen him coming. It told me I could have it for 69p.